It is not hard to realise some similarities between comic books and videogames. Both are very popular in the entertainment industry, are based on narrative images and have a direct connection with the film language. For these reasons, for decades the entertainment industry have used their popularity to create transmedia narratives that encompass the universe of movies, animations, comic books, and games. In addition to their value as entertainment, both media are gaining increasing recognition as potential art forms. Comic books are more and more closer of literature, while graphic novels are nominated for and often win prestigious literary awards. Examples of this trend are “American Born Chinese” by Gene Luen Yang, finalist of the National Book Awards; “Sandman” by Neil Gaiman, winner of Hugo and Nebula science fiction awards; and “Bad” by Art Spiegelman, winner of the Pulitzer Prize. On the other hand, videogames, particularly the titles of independent studios, are gradually acquiring a poetic approach, i.e., characteristics more related to the setting, to the aesthetics of the software and to the public reception, and less linked to the mechanics of the game. These elements are very similar to those in interactive art, and the games with such characteristics were nicknamed “notgames” (HARVEY & SAMYN, 2010) because they don’t fit into previously defined categories. This year, the curatorship of FILE Games presents “Game Comics”, a videogame category that dialogues with comic books in terms of their aesthetics, narrative, and playability. That is the case of “Framed”, by Australian studio Loveshack, which uses the aesthetics of noir comic books and is remarkable for its unusual playability that takes place through the move of framings creating various narratives. Another example that plays with framings is “Gorogoa” by Jason Roberts, a hand-illustrated game, whose juxtaposition of frames guides the development of the story. In “White Night” (OSome Studio) there are no framings, but we can notice black and white graphs based on the comic books “Sin City”, by Frank Miller. In addition, its thrilling narrative brings clear references to Alfred Hitchcock’s films, to German expressionist movies and to other thrilling games such as “Alone in the Dark”. On the other hand, “Kentucky Route Zero” is a five-act videogame telling a magic, somber adventure, with graphs similar to rotoscopies often used in comic books. Without forgetting that games are a playful activity, the curatorship of FILE Games 2014 stresses another aspect of the universe of games with the exhibition “Interplay”, with games requiring more than a sole player. 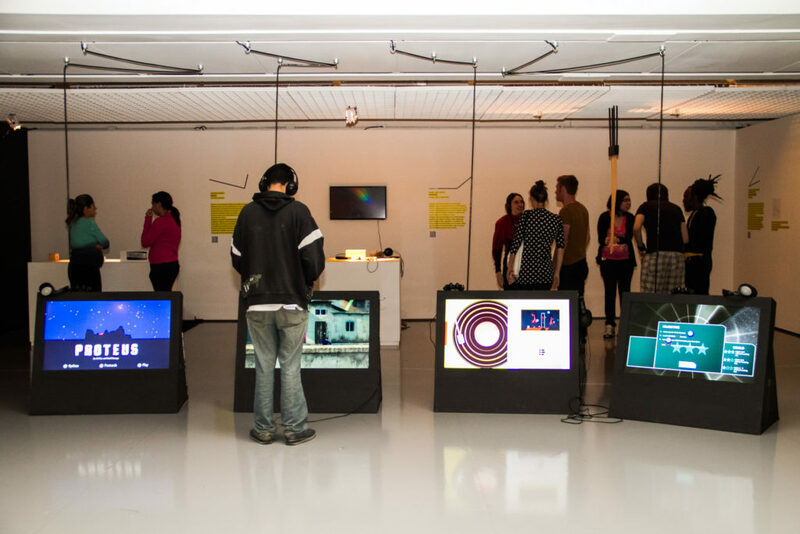 This small exhibition includes three games for tablet created by Dutch studio Game Oven – “Bounden”, “Fingle” and “Bam Fu”–, and two games for Xbox – the funny “FRU” and the frenzied ” Lovers in a Dangerous Spacetime “. Besides the exhibition “Interplay” and the “Game Comics”, the curatorship presents other highlights such as the award-winning games for PlayStation “Papo & Yo”, “Proteus”, and “Sound Shapes”. “Papo & Yo” is the story of Quico and his best friend, Monster, who has a serious addiction: poisonous frogs. Whenever he eats them, Monster becomes extremely violent but, during their adventures, Quico will help him to face this problem. “Proteus” and “Sound Shapes” are musical games: the first is described by many as an antigame or a notgame, i.e., it is an exploratory game featuring a open universe whose elements possess a musical signature; the second is a platform game full of musical puzzles. FILE Games 2014 presents the exhibitions “Game Comics” and “Interplay”, as well as brand new titles. “Game Comics” is a videogame category that dialogues with comic books in termos of aesthetics, narrative, and playability. In taking into account that games are a playful activity, “Interplay” brings another aspect of this universe with games for two or more players!